Abstract. Improving the ability of regional climate models (RCMs) and ice sheet models (ISMs) to simulate spatiotemporal variations in the mass of the Greenland Ice Sheet (GrIS) is crucial for prediction of future sea level rise. While several studies have examined recent trends in GrIS mass loss, studies focusing on mass variations at sub-annual and sub-basin-wide scales are still lacking. At these scales, processes responsible for mass change are less well understood and modeled, and could potentially play an important role in future GrIS mass change. 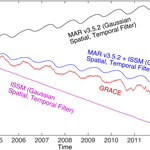 Here, we examine spatiotemporal variations in mass over the GrIS derived from the Gravity Recovery and Climate Experiment (GRACE) satellites for the January 2003–December 2012 period using a "mascon" approach, with a nominal spatial resolution of 100km, and a temporal resolution of 10 days. We compare GRACE-estimated mass variations against those simulated by the Modèle Atmosphérique Régionale (MAR) RCM and the Ice Sheet System Model (ISSM). 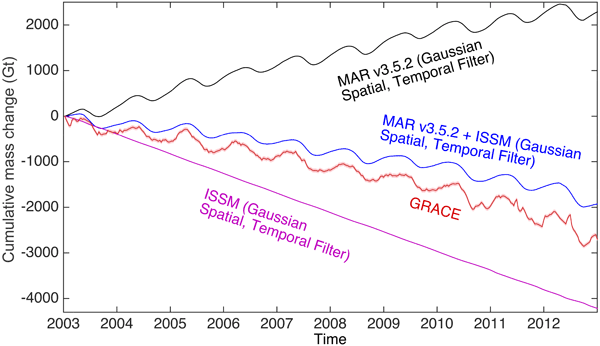 In order to properly compare spatial and temporal variations in GrIS mass from GRACE with model outputs, we find it necessary to spatially and temporally filter model results to reproduce leakage of mass inherent in the GRACE solution. Both modeled and satellite-derived results point to a decline (of −178.9±4.4 and −239.4±7.7Gtyr−1 respectively) in GrIS mass over the period examined, but the models appear to underestimate the rate of mass loss, especially in areas below 2000m in elevation, where the majority of recent GrIS mass loss is occurring. On an ice-sheet-wide scale, the timing of the modeled seasonal cycle of cumulative mass (driven by summer mass loss) agrees with the GRACE-derived seasonal cycle, within limits of uncertainty from the GRACE solution. However, on sub-ice-sheet-wide scales, some areas exhibit significant differences in the timing of peaks in the annual cycle of mass change. At these scales, model biases, or processes not accounted for by models related to ice dynamics or hydrology, may lead to the observed differences. This highlights the need for further evaluation of modeled processes at regional and seasonal scales, and further study of ice sheet processes not accounted for, such as the role of subglacial hydrology in variations in glacial flow. How to cite: Alexander, P. M., Tedesco, M., Schlegel, N.-J., Luthcke, S. B., Fettweis, X., and Larour, E.: Greenland Ice Sheet seasonal and spatial mass variability from model simulations and GRACE (2003–2012), The Cryosphere, 10, 1259-1277, https://doi.org/10.5194/tc-10-1259-2016, 2016. We compared satellite-derived estimates of spatial and seasonal variations in Greenland Ice Sheet mass with a set of model simulations, revealing an agreement between models and satellite estimates for the ice-sheet-wide seasonal fluctuations in mass, but disagreement at finer spatial scales. The model simulations underestimate low-elevation mass loss. Improving the ability of models to capture variations and trends in Greenland Ice Sheet mass is important for estimating future sea level rise.